Help a novice thief pull off her biggest heist yet. (Optional) Receive quest through the Collections tab. Talk to Quen inside any Outlaws Refuge. 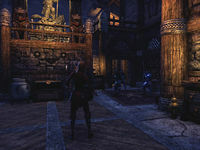 Meet Quen at the docks in Woodhearth (Greenshade), Wayrest (Stormhaven) or Windhelm (Eastmarch). Travel to Fulstrom Homestead and find a way inside the manor. Gain access to the treasury and attempt to steal the Giovessen Skull. 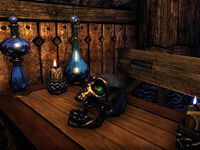 Travel to Abah's Landing and find the Thieves Den. Once you've gained access to the Thieves Guild DLC, a young Altmer named Quen will appear in any Outlaws Refuge. This quest can be accepted from the Collections tab, at which stage you will be directed to Quen. Alternatively, she will offer the quest herself if you encounter her naturally. "Are you here about the job? To forestall any confusion—yes, we split the proceeds equally. And no, I will not budge on that point." "You mean ... you aren't here about the notice? Well, allow me to explain! I need a partner for a difficult job. It pays well, but it involves travel, and there is some danger. Does that sound like the sort of thing that might interest you?" Go to the harbor in your home alliance which is either Woodhearth, Wayrest, or Windhelm and meet Quen. "You made it. I wasn't certain you ... well, I'm glad you're here. So, the details! "We're looking for a relic called the Giovessen Skull. We slip inside the treasure room, grab our prize, and depart before anyone knows the difference. After that, we split the proceeds and go our separate ways." "One more thing ... I'd prefer not to spill any blood, but I leave our safety to your discretion. If a guard sees you, take shelter in a hiding spot. Enter the boat to travel to Fulstrom Homestead. When you arrive on the island, fight your way past the wolves and approach the outer compound stealthily. The majority of the NPCs in this area are just citizens, who will increase your bounty if they see you but are otherwise harmless and can be killed if necessary. Watch out for Manor Guards, who act as any other guard would. They will attack on sight and cannot be killed, and will take your stolen items and bounty if they manage to kill you. The ones in the outer compound carry torches and have their detection radius indicated by a blue circle on the ground. Luckily, they move slowly and there are hiding spots scattered around the area. These special places are marked by a yellow glow and will completely conceal you if you activate one, even if you have been detected. Make your way towards the portcullis marked on your map. Do not try to swim towards the portcullis, as you will be killed by slaughterfish. The portcullis won't open on your first try, and Quen will climb over to the other side (displaying some remarkable acrobatics) to a winch. Now open the portcullis and enter the inner compound. This area has Manor Guards, more civilians, and NPCs called Pack Masters that accompany wolves in the more remote parts of the grounds. Make your way past these to the secret entrance on the east side of the house. Pick the lock on the entrance and enter Fulstrom Manor. Approach the bookcase between the doors and it will slide away to reveal a combination puzzle. Turn the tumblers so the correct symbol is at the top. The correct combination is displayed on top of the bookcase (Horn, Candle, Skull). The bookcase will slide back into its previous position and the doors to the treasury will open. Ambushed! The Iron Wheel was waiting for you and Quen the whole time. Enter the treasury, locate the Giovessen Skull and take it. At this point you will be confronted by Chief Inspector Rhanbiq, a member of the Iron Wheel, who will order you to return the Skull. You have the option of either placing the Skull back where you found it, or attacking the three Iron Wheel members—Captain Brand, Sahdabeh, and Yumanam—who enter nearby. "Nobody! Well ... I sent word to the Thieves Guild of Abah's Landing. They were interested in acquiring the Giovessen Skull. Wait ... did you hear that?" A mysterious Argonian named Walks-Softly will approach and will reveal himself to be part of the Thieves Guild. Listen to the conversation between him and Quen and talk to him after that. "Didn't realize there were two of you. Next time the Iron Wheel springs a trap, I'll bring another uniform." Who are you? What's going on? / First tell me who are you and what's going on. "I'm Walks-Softly, and we're currently fleeing the Iron Wheel. We can talk about the details once we've actually fled. Oh. What are your thoughts on spiders?" Spiders? What do you mean? "When I was posing as one of the manor's guards, one of the actual guards mentioned these old catacombs. Said they were "a basket full of spiders." Unless that's an obscure Nord expression, I'm guessing he meant actual spiders." You said you were from the Thieves Guild. What is that? "Nothing we should discuss right here. But I promise, as soon as we've escaped the Iron Wheel, I'll answer your questions." "On the bright side, these only have four limbs." Continue deeper into the catacombs. The first half of the catacombs contains draugr, some of whom can be snuck past if careful. The final half is filled with spider enemies, including a giant spider called Crypt Dweller Drusilla. Exit the catacombs and speak to Walks-Softly near the boat. "Could've lived my entire life without running through a spider pit. But we made it through. you'll make a real impression in Abah's Landing." "The Thieves Guild. And my guildmaster, who can explain why the Iron Wheel thinks you deserve the same fate they've inflicted upon us. It's an unpleasant fate. It involves branding irons." What if I don't want to go to Abah's Landing? "You are your own master. But the Iron Wheel is relentless, and they know your face. They know your partner's face, too. So tell me where we're all headed. I suggest Abah's Landing, as soon as you're able." 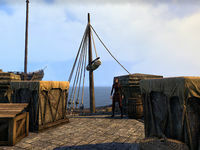 If you choose to go to Hew's Bane, you will arrive on the docks of Abah's Landing. Talk to Walks-Softly there. "Always a pleasant journey to Abah's Landing. Head to our Thieves Den—the guildmaster awaits. Your partner and I will be along when she's less expulsive." Where is the Thieves Den? "Hidden within an old cistern that's long forgotten by this city's merchant lords. A new home for us, after the Iron Wheel tore apart the old one. It's a bit damp. You get used to it." Now go to the Thieves Den in the western part of town and talk to Zeira to complete the quest. 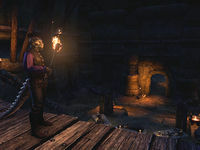 She will offer you formal membership of the Thieves Guild, which will unlock the related skill line and costume as well as several daily quests. You will also be given a random piece of foot armor from the Bahraha's Curse set. "Walks-Softly sent word of your time at Fulstrom Homestead. Said you slipped out from between the Iron Wheel's greedy fingers." Yes. You must be the guildmaster. "I am, but call me Zeira. Titles don't carry weight when you live in a cistern. Pretty bold of you and Quen to go after the Giovessen Skull. Did you know she sent a letter, asking to set up a meet? Rookie mistake—the Iron Wheel read her mail." They knew we were coming all along? "That's why I sent Walks-Softly to pull you out. Don't get me wrong. Quen may be green, but she planned a real heist—the kind we used to pull, before the Iron Wheel captured or killed most of us. Why is the Iron Wheel after the Thieves Guild? 'You heard of Magnifica Falorah? She's a noble from Taneth with a substantial dowry in her family tomb. We tried to steal it—but we failed, and she hired the Iron Wheel to punish us. I hear their leader thought you worked for us. Want to make it official?" "If the great Chief Inspector Rhanbiq thinks you're part of the guild, who I am to disagree? We need good thieves—capable thieves, like you and Quen—to pull ourselves out of the gutter. So, care to join the Thieves Guild? We have nowhere to go but up." I'll join the Thieves Guild. "Good—you aren't afraid of a challenge. The more you do for us, the more gold and respect you'll earn. Reputation goes a long way with us. Bringing us the Giovessen Skull is a good start. Here's your cut. Don't worry, Quen will get her portion." I should find her in an Outlaws Refuge. Quen arranged transportation to the job, but wasn't keen to share the particulars until she knew I was committed. She'll tell me the details when I meet her at the docks in Woodhearth/Wayrest/Windhelm. Quen revealed our target is the Giovessen Skull, a treasure held in the frigid Fulstrom Homestead. When I'm ready, we should take the boat at the docks in Woodhearth/Wayrest/Windhelm. Quen and I arrived at the shores of Fulstrom Homestead. We should make our approach and find our way past the main gates. Quen and I made it past a portcullis. We should make our way past the guards and find a way inside the manor. Now that Quen and I are inside the manor, we should search for a way into the treasury. Quen and I made it into the treasury. The Giovessen Skull is here—all we need to do is steal it. Quen and I were set up! I should follow her lead. Quen and I were set up! Chief Inspector Rhanbiq and his "Iron Wheel" demand I return the Giovessen Skull and surrender. But if I wanted, I could fight them off and steal the treasure. Quen will follow my lead, whatever I decide. I'm committed. If I can't defeat these Iron Wheel soldiers, they will arrest Quen and I! I need to figure out what's going on. I should speak with Quen—maybe she has answers. It seems Quen and I have some unexpected aid. I should listen to what this Argonian has to say. Walks-Softly helped Quen escape the manor with a guard uniform. But to evade the Iron Wheel, he and I must flee through the catacombs. Quen will steal a boat and meet us at the exit. Walks-Softly and I should find a way to escape the catacombs below Fulstrom Homestead. Quen will steal a boat and meet us at the exit. Walks-Softly found an exit! I should follow him to the surface. Quen stole a boat, as promised. We should escape Fulstrom Homestead before the Iron Wheel catches on. I should speak with the guildmaster of the Abah's Landing Thieves Guild. Perhaps I can get some answers. Walks-Softly mentioned "a Thieves Den." Finishes quest Zeira considers the job at Fulstrom Homestead to be a successful audition into the ranks of the the Abah's Landing Thieves Guild. She invited Quen and I to join. I should speak with her about the offer.